Who doesn’t like a good “possession” story? Yep, those sorts of ghost/demon/entity tales wherein a strange force takes over the body of a living host are where it’s at. I mean, The Exorcist, written by William Peter Blatty and directed by William Friedkin, is one of my favourite films. “Wolf in the Fold”, written by acclaimed horror author, Robert Bloch, is one of my favourite episodes of the original 1960’s Star Trek series. At their essence, those types of stories remind us that we’re not always in control of our actions; that human beings can still revert to their base, most wild forms. But what happens when the ghost/demon/entity takes over the human host and turns him into a superhero…that kills villains? That’s the intriguing question that today’s release of Dream Thief asks. Dream Thief is a five issue mini series written by Bram Stoker Award winner, Jae Nitz, so you know he can tell tales of a dark nature. It’s illustrated by Greg Smallwood, who’s work here is truly noir in flavour, a perfect blend of light and shadow and, if the previews are any indication (which you can find here), really interesting page layouts. The series tells the tale of John Lincoln, a not entirely likable man even if he is charismatic, who steals an Aboriginal mask from a museum. Vengeful spirits, released by the mask, possess Lincoln as he sleeps, exacting revenge on those that require justice. The problem? Upon waking, Lincoln’s hands are bloody, and not only must he now dispose of dead bodies, he must piece together what happened and why it happened because he can’t even remember what went down or where he spent his time while being possessed! Dream Thief is a dark, mysterious superhero tale that definitely greys the area of what a hero should do, how they should act, and how they even qualify someone as a villain. Heck, the final panel of the teaser preview tells us that Lincoln unknowingly killed his girlfriend and that she deserved her death! The series looks to raise some hard, even violent questions, as much a crime and horror tale as a superhero one. Is it even a superhero comic? 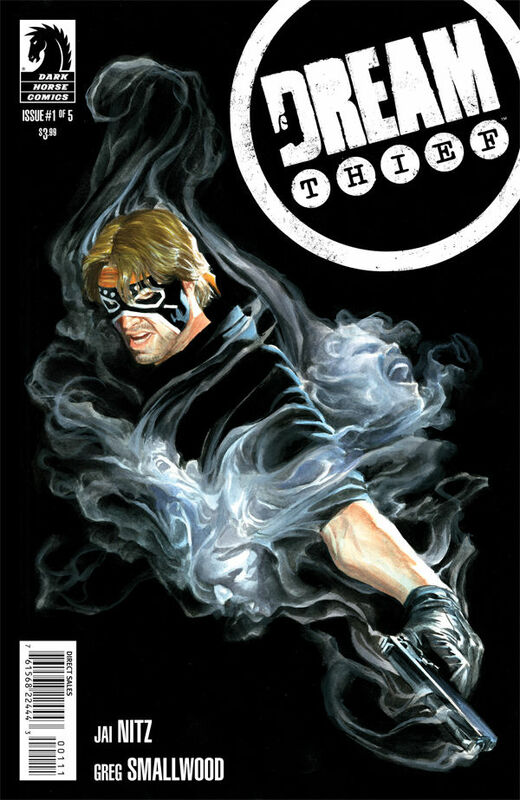 Make the run to your local comic book shop today and pick up Dream Thief #1. We can find out the answers to these difficult questions together – all while John Lincoln tries to figure out his new “heroic” life!